values. Through YuppTV, you can access from anywhere or anytime all your favorite channels using the smart devices through a single subscription. 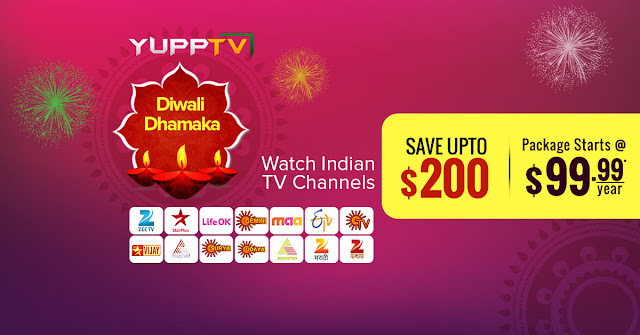 YuppTV wants to give you more happiness and ensure that your entertainment moments are fantastic, so there is no better idea to commemorate Diwali than taking advantage of the best deals of YuppTV that proposes you the best discounts on subscription of Indian TV Channels. You can also enjoy this celebration with Diwali movies and shows through the Live Indian TV. than gifting which is in the US region. For this region, the deals are excellent so that you can make savings of up to $200 through subscription packages to watch Indian TV Channels beginning of US $ 99.99 per year.You can participate in these seasonal festivals with great style, having fun and watching the best movies and shows South Asians. the Live Indian TV too.